One of my all-time favorite vegetables by far is cauliflower. There's so much you can do with it! Have it raw, riced, mashed, roasted, steamed, into a pizza crust! The possibilities are endless. 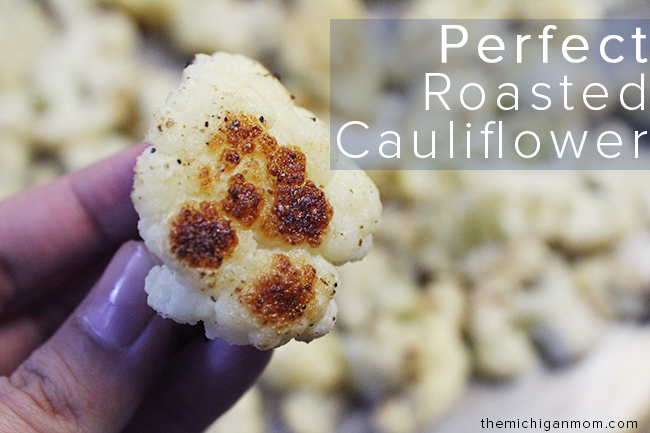 Cauliflower is versatile, full of nutrients, and most importantly is absolutely delicious! And here is my favorite way to make it: Roasted. My love for cauliflower started when I was much younger and I remember the day perfectly because it's the day my mom first introduced cauliflower to me in her chicken and vegetable stir-fry. I noticed my siblings completely ignoring the cauliflower in the stir-fry and I wondered why. The way my mom cut it made it look like little potatoes and I thought to myself, "They LOVE potatoes, why aren't they eating them!" The rest is pretty much history, but I will tell you that for YEARS I thought I was eating some form of potato. Ever since then, I started eating cauliflower like it was nobody's business– all thanks to my mom. THANKS MOM! Now that I'm a mom myself, I made it a commitment to try to introduce new fruits and vegetables to Zach while he's still young. It's no surprise that this roasted cauliflower recipe is actually one of his favorites! Can you believe that? My little 3 year old growing a sweet tooth towards vegetables. When I was 3 I can assure you vegetables were not my favorite. This roasted cauliflower recipe is perfect because it's easy to prepare, takes about 15-20 minutes in the oven, and will make a perfect side-dish to your family meal, guaranteed. Even my siblings who are not fans of vegetables (their loss!) are totally in love with this roasted cauliflower recipe and beg me to make it as a staple for our family meals together. Personally, I love eating the roasted cauliflower as it is! Sometimes I'll dip it in hummus, but for the most part I can eat this all day long as it is. It's just so tasty! This recipe will be a great addition to your family meal. You just have to give it a try! Do you love cauliflower? What is your favorite way to eat it? Rinse the Cauliflower and cut it into florets and bite size pieces. Spread the Cauliflower on a baking sheet and sprinkle with salt, pepper, and cumin. Bake in the oven for 15-20 minutes, or until the Cauliflower starts to become golden. Enjoy!